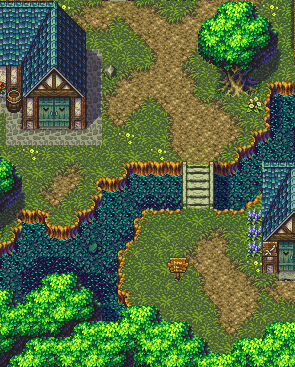 You should go look up some tiles from various SNES/GBA games, particularly RPGs like Chrono Trigger, Final Fantasy 6, Legend of Zelda, etc. to get a better idea of how they tackled pixelling grass. Also look at how grass is in real life, pay attention to how light affects it, etc. I think the former would be better for you at the moment, though. ehhh - again feel obligated to respond after an old tutorial link. Basically theres as many different ways to represent grass as you can think of representing it. certain things work better than others. certain methods are more popular than others. finding a style that will work for you will certainly help you out much better than trying to emulate someone elses method of doing something. Having said that, i created a quick little step by step example of how I might go about making some grass tiles today. note this assumes a pretty simple case of using 32x32 tiles (SD3 screenshot above uses 16x16 tiles, which allows for more granularity so to speak, which can translate into more versatility with transition cases, hiding seams, making special cases, etc). just using some basic 'spruces' of grass. they look a bit leafy because its a quicker method than trying to emulate thinly bladed grass. also unless the grass is quite tall, trying to define thin blades of grass just doesnt work out very well, because at the pixel level, even that doesnt give you the proper level of detail to insinuate little blades of grass, so we just work with implied 'clumps' of it. then if i wanted to i might start to imply a little depth. notice im not really taking much care in this example to cleanliness or blending or anything. the greater care taken the more smooth the result will be. this basically just adds an extra layer of depth if you want a 'thicker' grass (note games and game mockups do quite well using rather flat colors for grass with just the occasional groups of implied grass, much more sparse than this). you can take it a step further if you want and add different values of highlights in between the existing clumps to create more subtly lit areas of grass clumps. your grass will naturally look denser doing this. perhaps it might allow you to more strategically place some of your grass shadow. from here, add different tiles with different varieties of patterns of clumps or even various different layers of 'depth' for more organic composition of your grass texutres. NOTE: these clumps are rather sloppy and more care could be taken to make it cleaner and more aesthetically appealing, but thats where the grunt work to pixelling comes in. I made this progression in about 10 minutes, id spend more time on it but i unfortunately have many other things to be doing lately :/. hopefully this will give you some more insight on how you _could_ go about doing some grass. Of course this isnt the only way to do it and maybe other people could jump in on how they go about doing their grass as well. All sound advice, st0ven, and the end result is very nice looking. I also ask because even though your grass tile looks very nice, I don't see how I'd be able to transition to another tile with it. I've always had trouble with that thick looking sort of grass!